Alea, a large cube-shaped flowerpot, is Dirk Wynants’ latest design. With this design he wanted to solve a frequently occurring problem: large flowerpots make a great decorative addition, but they are very hard to move. 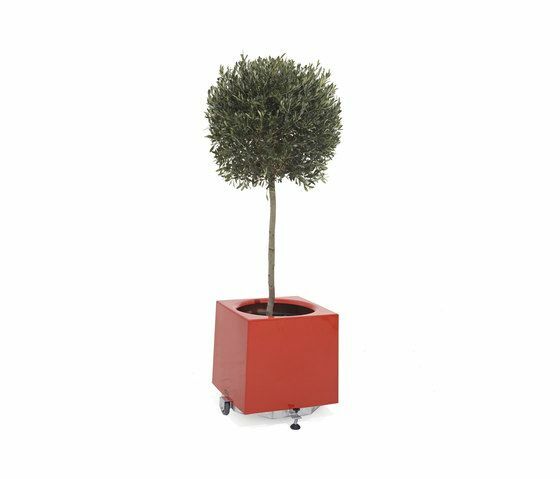 Alea offers the perfect solution to this problem, as it consists of a frame on wheels hidden by a glass-fibre flowerpot cover. First you put the plastic pot in which the plant will grow, on the galvanized steel frame. Then you slide the cube-shaped (glass-fibre) flowerpot cover over the plant and the frame. If you want to move the plant, you just lift the flowerpot cover 20 cm and turn it 45°. Now that the wheels are released, you can easily move the unit. When the unit is in the desired spot, just carry out the same operations in reverse order to prevent the unit from moving. Alea is available in two sizes (52x52 cm and 90x90 cm) and five colours (white, black, ivory, beige grey and red).